Unless this is the first web page you’ve seen after emerging from a coma, you know the mental landscape has changed. Society is a bit less sane than you remember. If you’re going to keep your level horizon, you’d better have a decent grasp on Why. The fading virtue of rationality concerns itself with primary skills, one of which is consequential prediction. The following store of experience results in wisdom, itself predictive of survivability. Thus, successful individuals will walk unbowed out of whatever arena tasks them, and do so over the charred bones of their competitors and opposition formerly possessed of a lesser ability to attend the rules of natural law. Nature, being impartial to any factor other than results, is vested in truth. Valid precepts, natural law decrees, always have been and ever shall remain. Men and women and the creatures brought before them to name have lived by its canon since the dawn of time. Nothing has changed in this regard since the onset of the Internet, social media, or politicized identity since it will not, ever. Step one on the road to clarity is acknowledging the essential state of affairs. Right about here is the point where rationality has a head-on, double-airbag-deploying collision with the human ego. Dammit, someone wants something. They need it, they are convinced, and so driven will believe anything reinforcing their conviction. Oh, bloody hell. Someone just bounced onto the Internet, and [censored] SHAZAAM! instantly found a community of hundreds of other idiots laboring under an identical delusion. Your addled neighbors just politicized their special interest and now spend most of their time affirming shared infirmity … and a great deal of money shaping social policy. Dear God. You might even be living in Oregon. Naturally, healthy thinking is going to ignore idiocy with in the bounds of polite interaction. The real problem is that politicized idiocy will not be ignored, as it is driven by the same need for affirmation that inflicted a divergent perspective in the first place. You’re going to play, or you will pay. Bigot. Wait, you were minding your own business, muddling along until presented with idiocy. And now you’re accused of bigotry? How does that happen? It occurred in the 1970s when said divergent groups adopted the aura of righteous indignation justly leveraged by the civil rights movement of the previous decade. One of the hallmarks of liberalism, as Andrew Breitbart told us, is the propensity to occupy unearned moral high ground. Before anyone knew it, challenging another’s behavior suddenly evolved into a situation able to threaten one’s reputation and livelihood. With enough people intimidated into silence or actually playing along, the moral environment degraded, and the agenda of people given to unsatisfying pursuits shifted to a focus progressive in more than one sense. Divorced from nature—that being vested in truth, you remember—they now expect to present the most radical lies and have them accepted as a subjective reality while another letter is added to the LGBT+ pantheon. What?? Bloody hell. Someone just rejected The Narrative. Call for backup! Call the Sensitivity Police! Call … the Internet! Feelings have been vandalized by an uncaring clot of humanity requiring excision from the arena of ideas. We are at a point where utterly indefensible delusions are being purposefully presented in order to intimidate society to not only accept them without comment, but accommodate the same endlessly. When commentary fails to arise, an agenda without a goal other than self-indulgence may advance, temporarily assuaging pathologically indefinable needs manifested in the pursuit of acceptance and enablement. When politicized dysfunction butts up against basic and constitutionally delineated rights of free expression, religious conscience, and willing association and wins, matters of course are not proceeding in a sustainable fashion. But what is there to do at this point? You’re being tested. Pick your side. Define and order your loyalties as is the business of an functionally adult mind. All journeying souls pass opportunities to leave the ideal road at every step. Ahead is truth, and on the left and right is another way. Lots of those, actually, as there are many more ways to deviate than remain on course. Truth is singular, in that there is only one best way to represent the actual state of affairs. Test a premise and find it solid, and you’ve not only discovered a truth but taken a step toward heaven. Make this basic functionality a lifestyle whose basis no one can legitimately criticize. If you find a cognizant and conversant Christian, they will be able to help you discover historicity and reliable precepts—truths unseen but for the search—you might not have discovered flying solo. You’re not alone, nor have you ever been, those of you who hunger and thirst for righteousness, for clarity, for something to embrace lasting throughout a count of days whose number will only tally rather than diminish. Claim your inheritance of life from its Source. God, loving you, wills it. In production news, the fourth title of Sean’s File, The Yemeni Package, is at nine percent in primary editing and anticipated for the end or beginning of the year. Another chapter in the building of Daniel Sean Ritter introduces the beautiful and deadly CIA case officer Thalia Kebauet, as Ritter’s team, now hers, pursues an emergent and charismatic advocate of terror across 1999’s United Arab Emirates. With the advent of tragedy elsewhere and in Dallas particularly, observers are again focusing on the role of law enforcement in civil society. As happens with any subject in free discussion, opinions in the marketplace of ideas exist in a range from reasoned, through the uninformed, to absurd. I’m just a guy who writes novels, but those titles result from of a lifetime of experience in a variety of environments, ones allowing me to present a storyline in plausible presentation. The details of where and what, put gently, are none of your business. A certain, significant amount of my store of witness, however, involves law enforcement. Particularly, familiarity with personalities who thrive, or at least function, in an entirely distinct existence from the overwhelming majority of the citizens they choose to serve. Law enforcement officers (LEOs) are, because of their unique vocation, insular. One can attempt to understand or empathize with them, but you will not entirely succeed without stepping into that world. Until you are in, proven, and accepted, you are out. They are, as a stressed and intense breed, largely adverse to judgment by anyone whose perspective cannot encompass their existence as humanity’s garbage collectors. Citizens cannot be aware of the children hurt or dead in accidents, abusive situations, or incidents of predation the officer at their driver’s window might have witnessed, memories with too little time passed in the interim to accommodate. Few of the unsworn have seen the expression of surprise in the dead eyes of a suicide, or smelled the odor of decomposition emitted by a body in an enclosed space, a plume that finally wafted into public to alert a neighbor. They likely have not been ready to kill another human being and had to decompress their physiology to continue doing their job. LEOs reside in a very real world, where one cannot easily sweep aside actualities in favor of comforting beliefs. That lack of emotional cushioning can make then brusque, and direct, and even dysfunctional if uncounseled. Callused cynicism at times traps their perspective in a dedicated pessimism preferring a rare pleasant surprise to being caught unguarded. They need continuous interaction with good people outside of their own bubble of perspective, and the nature of what they do denies them enough of it. In social settings, they are subject to hearing stories of supposedly undeserved citations. They watch people drink too much who might be planning to drive away from the venue into circumstances they have seen evoke tragedy. Afterward, they often choose instead to interact only with their own kind or set themselves into a cycle of isolation. They are never free from their oath of office and duty binding them to uphold the law, and the responsibility fallen with the weight of a cast bronze badge dropped into the palm of their hand. They see things most people will never need to endure, and those visions chase them even after they manage to fall asleep after twelve hours on the job. Three days might follow to adjust their circadian rhythms for the next rotation on the shift schedule. They remain people. Some of them are good at what they do because they were delinquents once, never caught or adjudicated, and so remained eligible for civil service. They are heroic, pathetic, brilliant, flawed, broken or absolute train wrecks just like the rest of us. They retain human weaknesses in an always-judging environment, one unforgiving of the least display of frailty, and the trial endures while they serve. Law enforcement is also as political a job as can come along. LEOs wield the power of government entrusted to their office, and the appreciation of power increases as one ascends any hierarchy. After a point, the same organizational tree can lose touch with the concerns of those on the street, whose interaction with the citizenry comprises the face of the department. Political concerns at times outweigh the practical and add to the stress of the job already dangerous in armed people. It is precisely the ever-present dangers inherent in their existence that should be in the forefront of anyone’s mind as they interact with law enforcement. They have a plan to kill you, because they are mindful of the law enforcement officers who themselves have been hurt or killed by people of all extractions and from all walks of life who turned on their brothers and sisters. No LEO plans on taking out a citizen at the beginning of any given shift. Every one of them, however, fully intends to go home once it is completed. There is a growing, fundamental lack of respect in today’s society. Respect erodes with an increasing sense of entitlement stemming from the ease with which we survive. Our essential inabilities, supported by technology, modern conveniences, and the long supply lines of a first-world existence, at times make the best of us impatient and frustrated. Sometimes, the condition progresses past the point where compensating influences can keep everyone alive. Too often, a law enforcement officer is there when or after the narrative fails, the false premise collapses, and things finally go bad. I understand them. They are members of a paramilitary organization with insanely constricted rules of engagement. At times, in the minds of their superiors, the reward for overcoming the odds against their survival is to fulfill their career as a human sandbag shielding their chain of command against incoming public opinion. They continue to inspire, hold my admiration, and at times frighten me. Life is always the same, once you commit yourself to clarity. A clear vision will arrive at the end of days in any event, and is best adopted at the beginning of one’s journey. What comforts we can garner along the way proceed in one way or another from knowing this. In production news, Ritter’s next is nearly two-thirds through primary editing and on schedule for a late-September release. On deck with him in this title is a portion of Terry Bradley’s back-story, prior to his appearance in Boone’s novels as Director of National Intelligence. You may also look forward to meeting Lucia Dorotea Crnjak, a young journalist and Bosnian caught in the maelstrom of 1995 with the rest of her emerging nation. The story woven around them, I promise, is one no reader will forget. True that, Ferris. But what do we see when we look? It depends on how we approach observation, doesn’t it? I grew up in what retrospect paints as a difficult environment. Namely, a farm located miles out in the country. I came late to the Greatest Generation, and my father lasted ten more years. Afterward, I had another eight to live with people who were dealing with too many of their own issues to provide any nurturing an ideal situation would offer. Those years made me retreat to reading, they made me strong to the Glory of God, and I have no complaints. Most of all, they taught me to think about what I saw rather than take information for granted. What I heard about myself and about the world was, at times, demonstrably false, and presented by people who derived comfort from disparaging others to fortify their self-image. So I became analytical as a means of emotional survival. I learned to think, and I discovered the gift of discernment, and both benefit my life and my writing to this day. So, what do people see when they look? Short answer: they see what is there, or they see what they wish. My working premise says ‘what is there’ is discoverable by design and definable in actuality. Dependable discoveries stand after examination and relate to supporting truths subjected to the same process previously. In this way, knowledge grows. After sufficient experience, one may anticipate consequences with a degree of accuracy to allow us a claim to dependable, guiding wisdom. That is the good road. It’s taken if we see what’s there. The other choice is to see what we wish. Premise and extension play no part in a perspective based on convenience. Indulgence? It feels good. Do that. Unearned moral high ground? Occupy it. One pursues advantage rather than achievement, because it is easier. One craves the feeling of well-being rather than circumstances beneficial in the long term. One turns inward instead of outward. One stops looking around, and misses something vital as a result. Most folly in current affairs results from ignoring the most vital aspect of reality, namely the will of The God Who Is. Faithful people have no obligation to argue morals or policy or any other subject from a secular perspective. If, for the purpose of outreach, one must, I would lead with a simple observation: whatever goes against its nature does not endure. Natural law states one circumstance follows another in emotionless causality. Function outperforms dysfunction, and increasing the volume of conversation does nothing to alter this vital dynamic. Nature does not support pretentious thinking. As things are what they are, so are we, within the limits we are set. If we accept our situation and adopt normative thinking instead, function builds on function to a satisfying experience. The price of pretentious thinking is an essential state of dissatisfaction. A flawed premise must extend repeatedly in the pursuit of a utopian vision only existing as a mirage of philosophy. As such, it is incontrovertible to those dedicated to normative, healthy, functional thinking, and breeds conflict. The process, unless abandoned, can continue to the point of systemic collapse, whether it is on a personal level or societal, and that is why such must be rejected as an act of love rather than enabled. Natural law favors function over dysfunction. It nurtures the former and abhors the last. In the end, it wins every time. The process can be less painful when better understood. Seen as it is, marriage becomes something understood rather than self-defined, as does sexuality, and gender, and any number of other topics available to view as one wishes instead of observe and accept. Natural law, satisfied, promotes life over death, love over hate, and peace above conflict. Dissatisfaction dissipates as function calms dysfunction, and finally, life is good. One would expect such from the work of a loving God. Look around to see if I am correct. Life moves pretty fast; if you don’t, you could miss it. 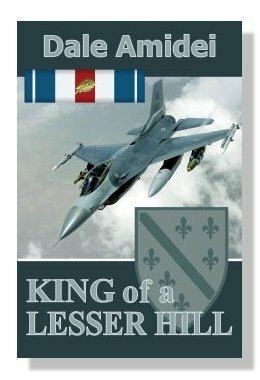 In production news, Novel8/Sean3, King of a Lesser Hill, is out of Content Edit and progressing through the first chapters of primary editing for a late summer/early fall release. Ritter and company’s adventure in Bosnia and Herzegovina promises to be an experience you will not forget. For humanity’s sake, some events never should be.